In the application form, Enter your name address, ward number, house number, other member details, details of old card, details of any surrender / reducion certificate. 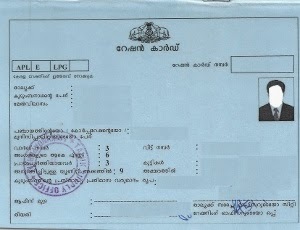 What are the documents required while submitting application for a new Ration Card? If applicant / member name belong to any other ration card issued by same TSO/CRO and the applicant is applying for new ration card to same TSO/ CRO, then He/She can submit the application for Reduction certificate along with the application for new ration card. When and where to submit the application? Place of submiting the Application for Ration card: Taluk Supply Office where the applicant's residing area belong to. You applications will be cross checked by the rationing inspector and Supply officer, Your photo will be taken and will be given a future date on which you have to get your new card. visit Taluk Supply Office on the given day to get the card. Some times you will be asked to fetch your's / member's old card when you go for receiving the new card. How to apply online for Ration card? You can apply online through the Website of Civil supplies or through Akshaya kendra. You should take the scanned copies of all reuired documents mention above. Fill in the online aplication and upload the scanned copies to the website. After submitting the application, take the printout of the online application and visit Taluk Supply Office with all documents and it copies on specific day (usually on wednesdays, kindly confirm this). There Your applications will be cross checked and verification process will be initiated and will be given a future date on which you have to get your new card.Visit on the given day and get your card. 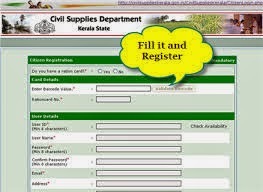 register as new user and apply from new ration card.